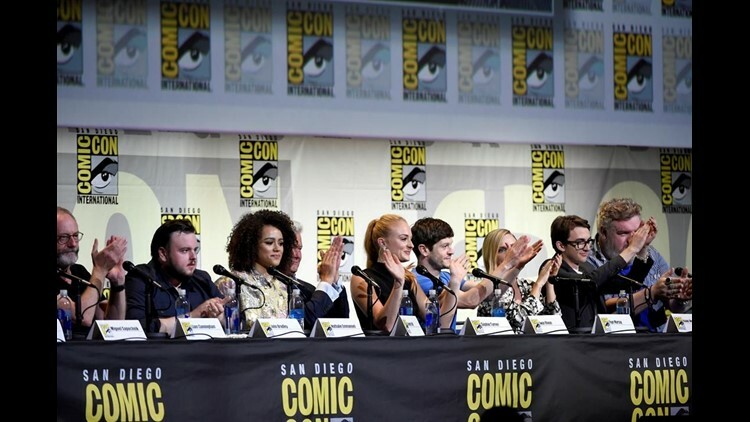 SAN DIEGO (CNS) - The casts and creators of Netflix's "Stranger Things," HBO's "Game of Thrones" and AMC's "The Walking Dead" are among the headline appearances at this year's Comic-Con International, which will run from Thursday, July 20, to Sunday, July 23, at the San Diego Convention Center. Organizers of the popular entertainment and culture convention finished unveiling the final four-day schedule today. Also taking the stage at the convention center's expansive Hall H will be Marvel Studios and Warner Bros., with both companies expected to tease their upcoming superhero and sci-fi blockbusters. The convention begins with a preview night Wednesday, July 19, before the real festivities get underway July 20. The first day of the convention will see 20th Century Fox get things underway at 11:30 a.m. in Hall H.
Friday in Hall H will be all about popular TV shows, with AMC's "Fear the Walking Dead" scheduled from 11:15 a.m. to 12:15 p.m., followed directly by the show it spun off from, AMC's "The Walking Dead," which will take the stage from 12:15-1:15 p.m. HBO's smash hit "Game of Thrones" will follow from 1:30-2:30 p.m., followed by Showtime's "Twin Peaks" at 2:45 p.m. and AMC's "Preacher" at 4 p.m.
Warner Bros. is scheduled to kick things off the third day of the convention, with a scheduled event from 11:30 a.m. to 1:30 p.m. Saturday. Batman actor Ben Affleck and Wonder Woman actress Gal Gadot are scheduled to make appearances, among others. At 2 p.m., actress Charlize Theron will be interviewed by Entertainment Weekly, followed by a panel discussion at 3 p.m. with the cast and creative minds behind Netflix's breakout hit "Stranger Things." That appearance will also feature a special sneak-peek at the show's upcoming second season, which is set to be released in October. HBO's critically-acclaimed "Westworld" will follow with a panel discussion and question-and-answer session at 4:15 p.m.
Marvel Studios will close out Saturday's events at Hall H with a slot foom 5:30 p.m. to 7 p.m. So far, the company's president, Kevin Feige, is the only named guest, though special guests are expected to include the casts and directors of the upcoming films "Black Panther" and "Thor: Ragnarok." A full schedule of events can be found online here.